Quick and easy but also interesting pattern? Thread: Quick and easy but also interesting pattern? I need to make a house warming quilt and I do not have a whole lot of time. It should fit the queen size bed. Do you have any ideas or suggestions. 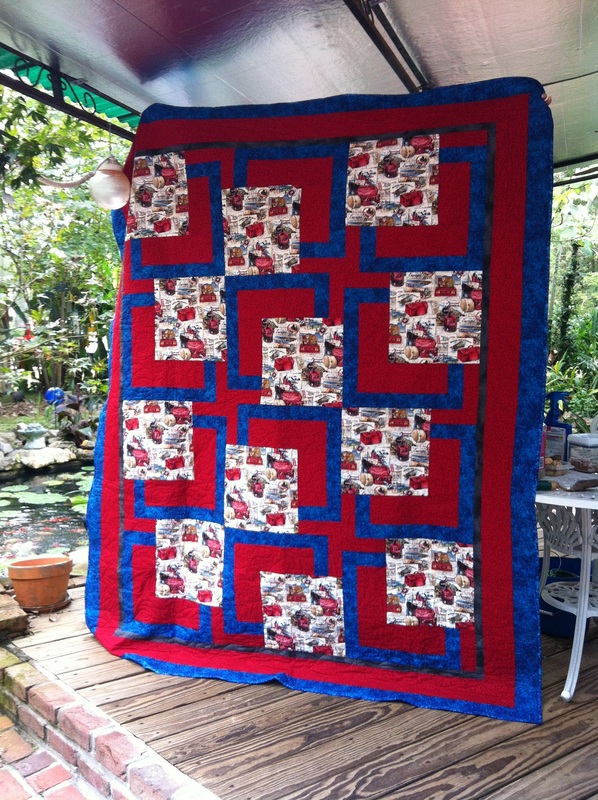 The recipient is not very traditional and not a quilter but likes quilts and does not have any. Help! I am drawing a blank! Thanks!!!!! Why not make her a throw? yep, or tube quilts. blocks make up fast and easily. You might want to take a look at Bernatex fabric's De Novo pattern - you'd need to add a few repititions to get it to the size you want - http://www.google.com/url?sa=t&rct=j...,d.aWc&cad=rja I have made this quilt lap size - it was super quick ( http://www.quiltingboard.com/picture...o-t205991.html ) and I know there are several other colorways posted on the board as well. And Bernatex has several free patterns that are pretty quick! Good Luck and show your progress! 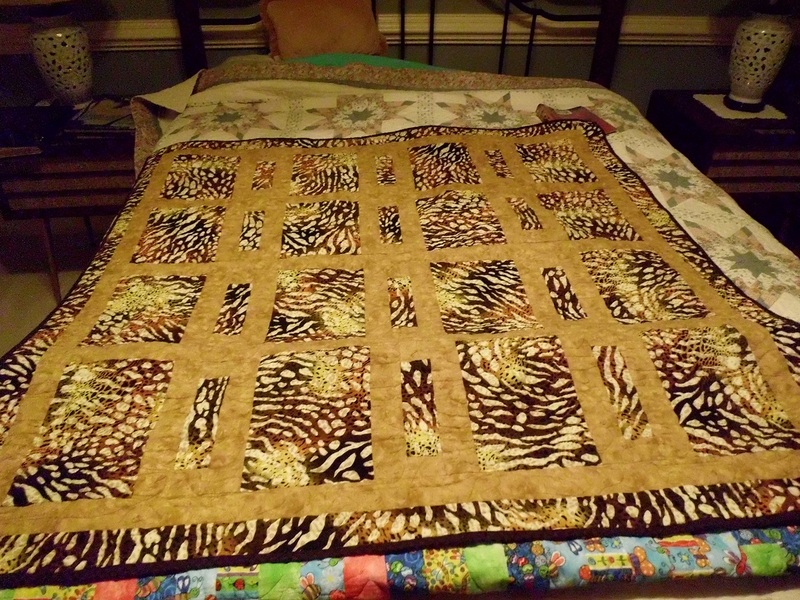 French braid quilts are fun, easy and look fabulous! they go together quite quickly- I've put together queen sized ones in a weekend. here's a weekend French braid quilt. How about the 10 min Block? The D9P is also very quick but look to those who have no idea like its a lot of work. How about MSQC Merry Go Round quilt. It is super simple and if done in modern fabrics and colours it could look very modern. It would work up quickly because of the pattern and could be done in colours to match the bedroom. If you don't know the bedroom colours you could do it in white/gray/ black? French braid quilts are really beginner friendly- easy quilts- they just look like they take a long time- the most difficult part is truly choosing a 12-color run. Trip Around the World is easy and looks like you spent forever piecing all those squares. Eleanor Burns method can be made in an afternoon an then add your time for quilting it. Tartan is right, MSQC Merry go round quilt. I just made one and it is super easy and quick. I just increased the size from what Jenny made. Made it start to finish in couple of days. Ditto Tartan....the MSQC Marry Go Round Quilt would be awasome made up in batiks for a more modern feel. Here's one I've done twice now - two fabrics, simple squares and rectangles. It's great to showcase a large print fabric, too. The Easy Trip Around the World is easy, fast, and fabulous! It looks way harder to make than it actually is and turns out beautifully every time! I've just finished piecing one and can hardly wait to start the next one. 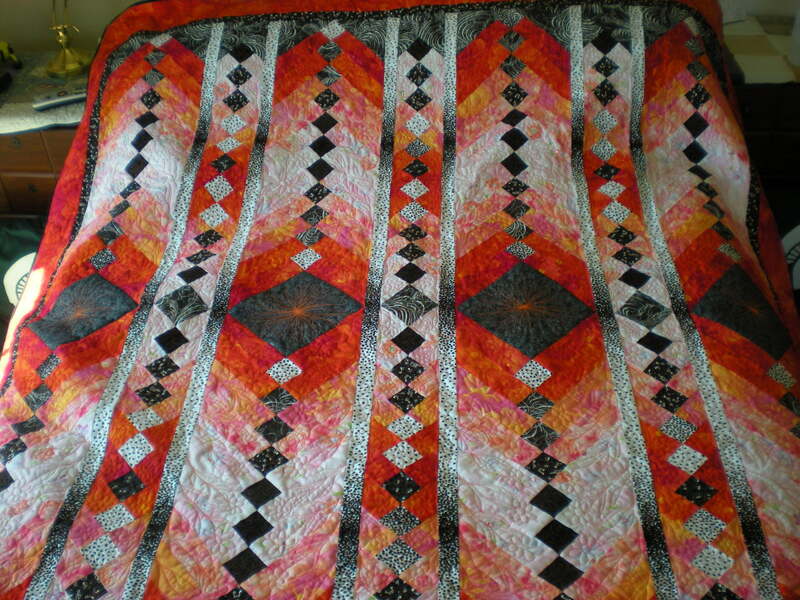 I am thinking any of the Turning Twenty quilts would do or a Warm Wishes quilt. I have seen both and they are quite pretty and rather quick to make also. This is beautiful, guess I need to try one soon. Wow, thanks for showing this. I agree with 10 min. block or D9P. If you have the charm packs the D9P goes together in an afternoon. For quick & gorgeous, you can't go wrong with the original BQ quilt using only 3 fabrics. Tip....don't use directional fabrics! I am a slow sewer & after cutting, which takes one afternoon, I can sew a queen size of this pattern together in one other afternoon. I made this for a BIL who was going through chemotherapy. You can use different big blocks to focus on more than one fabric, but for me, I love the 3 color ones. Just make sure you have enough contrast. The BQ pattern does not call for borders, but since I am a little bit traditional and I like them, I added them anyway. Last edited by Barb in Louisiana; 07-31-2013 at 05:47 AM. QuiltingaddictUK posted a link in 2011 for a double disappearing 9 patch - http://afewscraps.blogspot.com/2011/...ine-patch.html It's on my "someday" list. It looks complex but isn't.